Are you in need of conquering the JUNGLE of the Writing Process? Then these classroom signs are for you! Each step of the Writing Process is included, as well as "I Can" writing statements that help your students with editing their work! 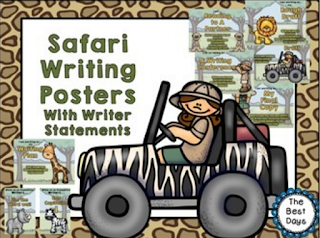 While you are there, check out all the rest of my Safari themed products! You can find them all at The Best Days. While you are there, click the GREEN STAR to follow me! You can also check me out at my blog or on Facebook!